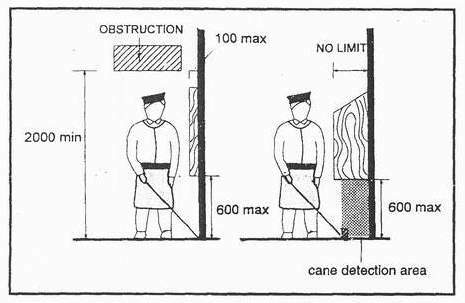 Protruding objects, such as directional signs, tree branches, wires, guy ropes, public telephone booths, benches and ornamental fixtures should installed with consideration of the range of a visually impaired person's cane. (detection area) (Eg. detectable objects such as planter box, refuse bin and warning surfaces). 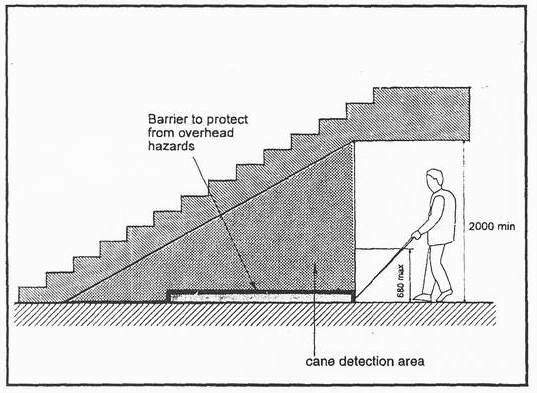 A barrier to warn blind or visually impaired persons shall be provided under stairways or escalators (Fig. 5.3c). Figure 5.3a . Protruding objects. Figure 5.3b : Overhead hazards.